Elisabeth Ogilvie was born in Boston and grew up in Dorchester, Wollaston, and Quincy, Massachusetts. She graduated from North Quincy High School in 1934. She spent summers with her parents and brothers in Maine, beachcombing, boating, and bird-watching, and these times became the inspiration for her writing. 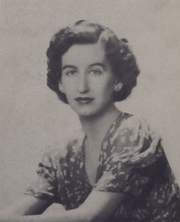 With the royalties from her first published novel, High Tide at Noon (1944), she bought an old farmhouse with 33 acres on Gay’s Island, where she lived with her companion, writer Dorothy Simpson, for many years. Her Bennett Island series of novels, which included the Tide trilogy, recounted loves, feuds, storms, and sea tales on a fictional Maine island. She also wrote a series of novels based on her travels in the Scottish Highlands. She also wrote 14 popular books for young adults, focusing on two new generations of the Bennett family. Her autobiography, My World is An Island, was published in 1950 and reissued in 1990. Elisabeth Ogilvie is currently considered a "single author." If one or more works are by a distinct, homonymous authors, go ahead and split the author. Elisabeth Ogilvie is composed of 8 names. You can examine and separate out names.